In 2013, Gregorio Magno was pondering a way to reward people in Seville for cycling and walking in order to promote sustainable mobility and fight climate change and air pollution in cities. With that goal in mind, he took part in a startup competition and developed a simple website. People loved his idea, and that's where Ciclogreen was born. Ciclogreen encourages users to make use of sustainable modes of transport. 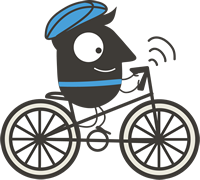 The app allows users to earn points (called CICLOS) by tracking activities such as cycling, walking running and skating. These points can then be turned into exclusive discounts with participating businesses. Rewards range from free breakfasts to waterproof sport cameras, free "glamping trips" and more. Each month new rewards are added to keep users engaged. Users of the app can not only see their points earned, but also other statistics such as average speed, calories burnt, money saved (by not paying for petrol) and CO2 emissions saved by their sustainable choice of transport. The idea is proving to be very successful - the app has over 10,000 users and more than 50 businesses are participating by offering either free gifts to users or by contracting the private Bike to Work and Walk to Work incentives programmes (https://www.ciclogreen.com/companies), allowing companies to build a healthier and more productive workforce while reducing their CO2 emissions. During the 2017 edition of EUROPEANMOBILITYWEEK, Ciclogreen will launch a new challenge website, including a competition for companies to reward those with more "bike to work" and "walk to work" kilometres covered during the week. After the competition, the accumulated mobility data will be shared with companies to provide (anonymous) information about how often and for how long their employees bike and walk to work. This will help companies promote healthy and sustainable habits for their employees. For more information, visit www.ciclogreen.com or download the Android app (iOS app coming soon).